In this blog under categories Obama you will find much more info about this man pertaining his links to Satan’s throne in Berlin. In this video update link by James Brownlow you will find the latest and most important information about the link of Obama with the prophetic literature found in the Bible. The numbers 1260, 1290, 1335 and others can be found in the books of Daniel and Revelation. You can find here a link to biblos.com where you can find Bibles in many languages to research the dates mentioned in the video. In the video you find that the slogan for the campaign of Barack Obama Yes you can. This slogan when played back in a recorder is Thank you Satan. So hidden in his slogan is the adulation of Satan by all who made it a slogan to be chanted in the campaign. Another important fact is the stadium of the Denver Broncos whose mascot a white horse ( the first horse listed at the first seal of the book of Revelation) is named Lighting. In Hebrew Barrack is lighting which is also a link to the presidential nominee coming out of the convention. Just these facts show how far the Democratic party is controlled by Satan’s followers at the present time. Obama’s 9th trip to Pergamos ??? Since 2008 John Tng has done an excellent job of finding relationships and numbers in the Bible that build a case to proof that Obama is the Antichrist. This last work can be added to those other excellent works. Thanks John!!! Strong’s Concordance is the most widely used concordance for the King James Bible. I believe God planted some key clues in Strong’s Numbers so that using them it is possible for us end-time watchers to search out the identity of the antichrist and the year of the rapture. This is quite a claim. Let me illustrate with an example on searching out the identity of the antichrist using Strong’s Numbers. We will look at the words H666 and G666, the most logical Biblical words that have an obvious link to the antichrist. Both words are very rare; in fact H666 appears twice in 1 Kings chapter 20 verses 38 and 41 while G666 is only recorded once in Phil 2:12. 1 Kings 20 is chapter 311 taking Genesis chapter 1 as the first chapter; Phil 2 is chapter 1105. Here comes the intriguing part: There are 793 chapters in-between ch 311 and ch 1105 excluding both ‘bookend’ chapters. The number 793 is the English Gematria of Barack Hussein Obama. Perhaps the above is just a coincidence. But what if we can find another similar pair? Going by the scripture, “In the mouth of two or three witnesses shall every word be established”, we would have found a double confirmation. To look for a similar pair this time we will try H793 and G793, a logical choice. The Hebrew word, H793, appears once in Num 21:15; the Greek word, G793, is clustered within two chapters in Second Peter chapters two & three (2 Pe 2:14 & 3:16). Numbers chapter 21 is ch 138 and 2 Peter chapters 2 & 3 are ch 1158 and ch 1159 respectively. Notice for the two words to form a pair of bookends, the occurrences of these words must be rare; or they must be clustered within one or two chapters. The number of chapters in-between ch 138 (Numbers chapter 21 for H793) and ch 1159 (2 Peters chapter 3 for H793) is 1020. Now if you have worked with Bible Numerics like I do, you may have an idea why this number 1020 matters. It matters because the only verse that has a gematria value of 666 is Num 10:20! וְעַל-צְבָא, מַטֵּה בְנֵי-גָד: אֶלְיָסָף, בֶּן-דְּעוּאֵל. What I have done so far is simply looking at Strong’s Hebrew and Greek Numbers to see if they throw light on Bible prophecy. The above two pairs of Strong’s Numbers, H666 & G666, and H793 & G793, clearly tell us that Barack Hussein Obama (793) is the antichrist (666). The first pair, H666 & G666, is a direct connection since the in-between number of chapters is 793, Barack Hussein Obama. The connection provided by the second pair, H793 & G793, is indirect since we need to realize that the in-between number of chapters, 1020, is linked to Num 10:20 — the only verse in the Bible with gematria 666. It turns out the number 1020 is an important number. It leads us to the blood moon tetrad, a major end-time sign given to the watching church in these last seconds of the church age. How is the number 1020 linked to the blood moon tetrad? If you search the Bible for the occurrence of these two words, ‘blood’ & ‘moon’, only three verses show up: Joe 2:31, Act 2:20, and Rev 6:12. The first two scriptures are essentially identical. Act 2:20 is Joe 2:31 quoted by the Apostle Peter on the day of Pentecost. The fulfillment of these two scriptures was barely five months ago when we last witnessed the final and fourth blood moon on Sep 28, 2015. Well, does it surprise you that Acts chapter 2 is ch 1020 of the Bible counting from Genesis chapter 1? You may be astounded too to know that ch 5776, the current Hebrew year, is also ch 1020! The Bible only has 1189 chapters; but if you keep adding four times, 1189 + 1189 + 1189 + 1189, and add 1020 after that, the sum is 5776, the current Hebrew year that began on Sep 14, 2015 — before the last blood moon Sep 28, 2015. Is this random or by design? Joe chapter 2 is ch 878 of the Bible. Starting from ch 878 as the first chapter, if you count forward 666 + 666 chapters, guess what, you end up on ch 1020! Furthermore, the gematria of Joe 2:31, the blood moon scripture, is 666 + 666 + 666 !!! So the number 1020 is intimately linked to 666 and the year 5776 and the blood moon tetrad before the coming of the LORD. This tells us we are super near to the rapture. It also tells us that the 666 beast is about to be revealed after the sign of blood moon tetrad. But before the 666 beast is finally revealed, the Christians must first be removed at the rapture (my next post). That is why the rapture is almost upon us. Look up, doves, it won’t be long now. Hang on. It will be worth the wait. John Tng has written numerous articles linking Obama to the Bible Antichrist. In a court of law if all the evidence that he has presented against Obama is shown in a trial he would be found guilty without any reasonable doubt. John has done an excellent job again with the facts and numbers surrounding Obama. Thanks John for this latest uncovering work, but I have been convinced for many years that Obama is the Antichrist. It is my opinion that Obama will become the Antichrist while he holds the position of President of the USA. What is more important is that he needs the USA’s power to accomplish this feat. As I see things he will wrestle the position of Antichrist before the elections in November. If a new president is elected in November his authority will cease on January 20, 2017 no matter the conditions existing in the USA and this he will not risk. So “”” no elections“””. Gematria is the substituting the letters for their corresponding number. The Obamacare Bill that was signed into law on March 23, 2010 is H.R. 3590. This could be the Act that will lead to the enforcement of the mark of the beast. What is my proof? Being a numbers man, I will look at the evidence purely from the numerical perspective. However, I want to stress that the source of my evidence is the Word of God itself. Somehow, God simply planted numerical clues in His Word in very simple manner so that even a child can follow. Before the bombshell is dropped on you, first take note of one intriguing connection hidden in this verse. This is verse 30,927 of the Bible, a rather huge number; this number is 3x13x793, which signifies 3 (triply emphasized) x 13 (number of rebellion) x 793 (English gematria of Barack Hussein Obama). The key link between the famous 666 scripture (Rev 13:18) and verse 666 (Gen 25:7) lies in the age of Abraham recorded in the latter verse: one hundred threescore and fifteen years, that is 175 years. It turns out verse 30,927 is verse 175 counting from the last verse of the Bible, Rev 22:21! So, what exactly is the bombshell? Get ready for this. The Hebrew gematria of verse 666 (Gen 25:7) is precisely the NUMBER of the OBAMACARE BILL — H.R. 3590! Do you think this is coincidence? Most likely not. God is the One doing the counting. Perhaps the Beast himself is aware of Scripture and decides to play games with us, a kind of taunting if you will. I have one more interesting numerical fact you should consider. As I wrote earlier (see http://www.fivedoves.com/rapture/2016/hisnumberis666.html), I was the first person on the Internet who made the connection that the day Obama leaves office on Jan 20, 2017, will be his 666th month since his birth. The duration between the signing into law of the HellCare Bill on March 23, 2010 and Obama’s last day in office, Jan 20, 2017, is six years nine months and twenty-nine days inclusive. But if you subtract 3 mths 23 days (numeric form of March 23) from 6 yrs 9 mths 29 days, the duration becomes SIX years SIX months and SIX days! The number 666 is concealed unmistakably in the in-between duration. If Obama is the antichrist (the probability is high), and if Obamacare is the bill that will lead to the enforcement of the 666 mark of the beast, then I venture to say our days on Earth will soon be over. Feb 15, 2016 The Obama you do not know! Thanks to BG Ellis we have this very good video that incorporates many videos together to make a case beyond any reasonable doubt of who Barrack Hussein Obama will become in the near future. His identity will be established at the beginning of the Tribulation period and for sure at mid point 3 and 1/2 years into the Tribulation when he sits in the throne at the rebuilt Temple in Jerusalem and says that he is “god” and forces the whole world to worship him. Why is it important to know this at this moment, why should you be concerned? There are many reasons to become aware of the reality of who this man is, one of them is the shortness of time left till the beginning of the seven year Tribulation and the coming of Jesus Christ to take His church out of the earth to avoid the Tribulation. Millions will not hear or take action on this trumpet blast heralding the danger that is coming and will be swept away in the destruction that is coming to planet earth. The majority will dismiss this as ramblings of a religious lunatic and ignore the warning, non the less this is for those who will hear the warning and prepare to receive the King of Kings and Lord of Lords, Jesus Christ at the Rapture. May I see you in the clouds soon. John Tng you were long to write an article and we missed them, but if you had to wait to research and investigate the article below the wait was worth having, congratulations. I have not been writing for a long time. It’s about time I start to write again (won’t promise a weekly post though 🙂 ). God hasn’t changed my mind about who the antichrist is; if anything, He has further confirmed it to me. The author observed that if Barack Obama were to leave office in Jan 2017, that would be 666 months since his birth. I believe I was the first person who connected the dots on this particular fact shortly after Obama won the election in 2008 and posted my observation on the Internet at this link, http://www.fivedoves.com/rapture/2008/obama_666.htm. Clearly, the number 666 is hidden in the letters ‘baa’. The letter ‘b’ resembles the digit 6 and the letter ‘a’ appears like the digit 6 when it is horizontally inverted. Being a numbers man, I straightaway saw that the letter ‘m’ can be made to look like the digit 3 if it is rotated by 90°. This scripture is the six thousand six hundred thirty sixth verse of the Bible counting Genesis 1:1 as the first scripture. Not sure if you have noticed, but the transformed name of Obama leads us to a Bible verse that contains the name BARAK! The name BARAK appears 13 times in the Old Testament all found within the book of Judges chapter 4 and chapter 5. Not only that, in this verse, Barak (highlighted in red box) is described as the son of ABINOAM (highlighted in blue box) — a clue that led Kevin Heckle to discover that the name ‘Barack Hussein Obama’ actually adds to 666! But there are more clues hidden in Judges chapter 5 that link Obama to the number 666. The LORD places Judges chapter 5 precisely where it is for a good reason. Consider this, Judges chapter 5 is the 216th chapter of the Bible counting Genesis chapter 1 as the first chapter. Obama was born on August 4 which is day 216 of that particular year in 1961. 216 = 6 x 6 x 6 !!!!!! The book before Judges is the book of Joshua, the SIXTH book of the Bible. The chapter after Judges chapter 5 is chapter SIX. If we count the position of the book of Judges from the last book of the Bible, the book of Revelation, the book of Judges is the SIXTIETH book. In Judges chapter 5, there are 31 verses. The scripture after Judges 5:12 in which the 13th reference to BARAK is found, is verse 13; the remaining number of verses is 18. Given the evidence of design thus far, it is not a stretch to suggest that these two numbers, 13 & 18, are intimating the presence of the 666 beast of Revelation 13:18 hidden in Judges chapter 5. Intriguingly, given how the way the KJV Bible is printed in book form, it just so happens that Judges chapter 5 is found on page 198, which is 66 + 66 + 66 !!! The number 06636 has a few interesting links to 666. The first time the name BARAK appears in the Bible is Judges 4:6, which is verse 6606 — a number that looks like 666. The number 06636 has THREE SIXES (666) in it. 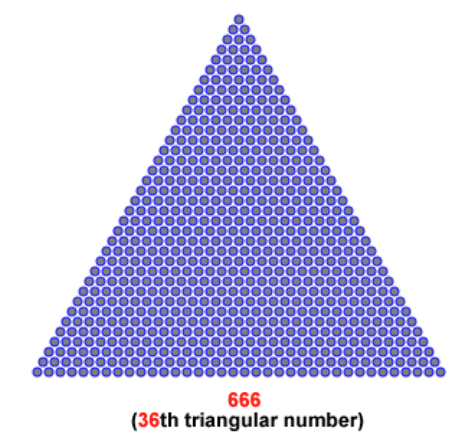 The first two digits of 06636 form the number 36 — this is the order number of a triangle made up of 666 counters (image below). We can look at it another way: begin with the number 1, keep adding the next number until the sum totals 666. By the time we reach 36, the sum is precisely 666 (1+2+……+36). The number 666 and its order number 36 are both present in the number 06636. The number 06636 is SIX TIMES 1106. If the number 1106 is taken as a month-day number, it is November 6 — the date on which Obama won the US Presidential election in 2012. If the number 1106 is taken as an hour-minute number, the time 11:06 is the 666th minute of the day. I want to leave you with the last hidden 666 code, saving the best for the last. I want to direct your attention back to the original clue that prompted me to post in the first place. The transformed name of Obama that becomes a number, 06636, led us to Judges 5:12, which confirms what Kevin Heckle discovered about Barack Hussein Obama the antichrist. Notice how the letter ‘a’ is horizontally inverted to make it look like the digit 6; the letter ‘a’ has to undergo a 180° transformation. The total angle of transformation for the letters ‘a’, ‘m’ and ‘a’ (the last 3 letters in OBAMA) is 180° + 90° + 180° = 450°. Add the number 450 to 216, the chapter order of Judges chapter 5, surprise surprise, the sum is 666 !!!!!! God certainly has a sense of humor. He embedded the name OBAMA in ABINOAM (symbolizing that BARAK came from the body of his father ABINOAM), and led Kevin to discover the Hebrew gematria of OBAMA, which is 113. As a result, Kevin was able to work out the Hebrew gematria of Barack Hussein Obama which indeed adds up to 666. My discovery essentially corroborates Kevin’s findings six years later. Doves, these two years will be very exciting years, full of hope and possibilities.